Decompositions Vol. II neatly packages half of Hour Of The Wolf’s recorded material to date and marks the first time many of these tracks have ever been released on vinyl – including 2007’s Waste Makes Waste EP, various unreleased covers, and the out-of-print split with Lewd Acts. 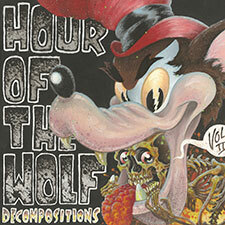 A must for any vinyl nerd or Hour Of The Wolf collector, Decompositions Vol. II comes with a digital download coupon and a bonus disc of the band’s 2009 Obsolete CDep on Hellfish (vinyl version only).